Our May 2014 Workbench of the Month comes from Mark Hicks from the Plate 11 Bench Compnay in Ozark, Missouri. 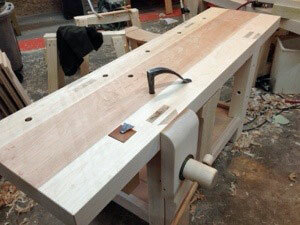 Mark builds tremendous maple Roubo Workbench kits that you can purchase, fine tune to your specifications and assemble. This Roubo workbench was constructed with a special tapped leg & Lake Erie Toolworks Leg Vise and a Peter Ross “Iron Package”. This is one great bench! We’ve put together a Plate 11 Workbench that you won’t find anywhere else. 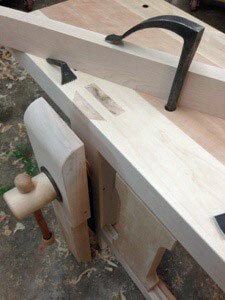 This bench comes complete with a leg vise from Lake Erie Toolworks that’s tapped directly into the leg. This also has a reproduction Roubo Plate 11 iron package hand forged by Peter Ross.